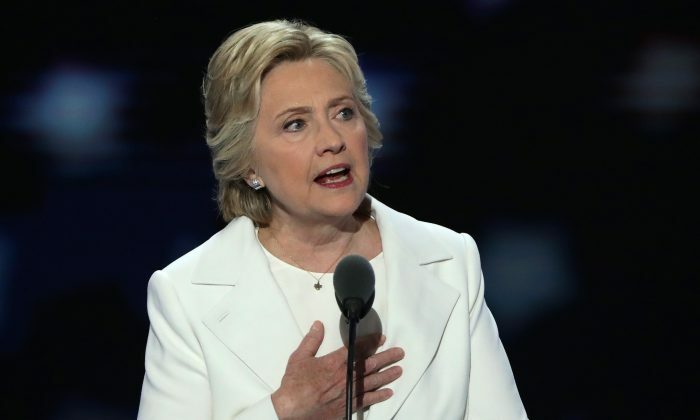 Hillary Clinton promised to get big money out of politics during her Democratic National Convention speech on Thursday in Philadelphia as she accepted the party’s presidential nomination. In her nearly hour-long speech, Clinton tried to woo Bernie Sanders supporters as she urged for unity among Americans. She also attacked her opponent, Donald Trump, asking people to imagine what it would be like to have him in the oval office with the nuclear codes. She then criticized his Republican National Convention remarks in which he said he could fix the country on is own. The former senator said she will pass a constitutional amendment to overturn Citizens United, the 2010 Supreme Court decision that allows unlimited corporate spending in elections. During the 2008 presidential campaign, Citizens United, a nonprofit corporation, made a documentary about the former secretary of state called “Hillary: The Movie,” in which she was highly criticized. Citizens United intended to show the documentary by buying airtime and having it accessible to viewers for free through on-demand. Citizens United v. Federal Election Commission, a 5-4 decision, ruled that money to influence elections and policy is a “free speech” constitutional right. The decision overruled a previous 6-3 decision, Austin v. Michigan State Chamber of Commerce, that allowed prohibitions on independent expenditures by corporations. “That’s why we need to appoint Supreme Court justices who will get money out of politics and expand voting rights, not restrict them,” said Clinton at the DNC as crowds cheered. “And if necessary, we will pass a constitutional amendment to overturn Citizens United!” she added. Clinton had previously promised to overturn Citizens United within her first 30 days in office. According to a poll by Bloomberg Politics last year, 78 percent of those surveyed said the Citizens United ruling should be overturned, while 17 percent called it a good decision. In her DNC speech Clinton went after big banks and corporations. “I believe American corporations that have gotten so much from our country should be just as patriotic in return. Many of them are, but too many aren’t. It’s wrong to take tax breaks with one hand and give out pink slips with the other,” she said. “And I believe Wall Street can never, ever be allowed to wreck Main Street again,” she added. However, Clinton has been criticized for benefiting from PACs throughout her career, with donations from individual donors from JPMorgan Chase & Co. and Goldman Sachs.